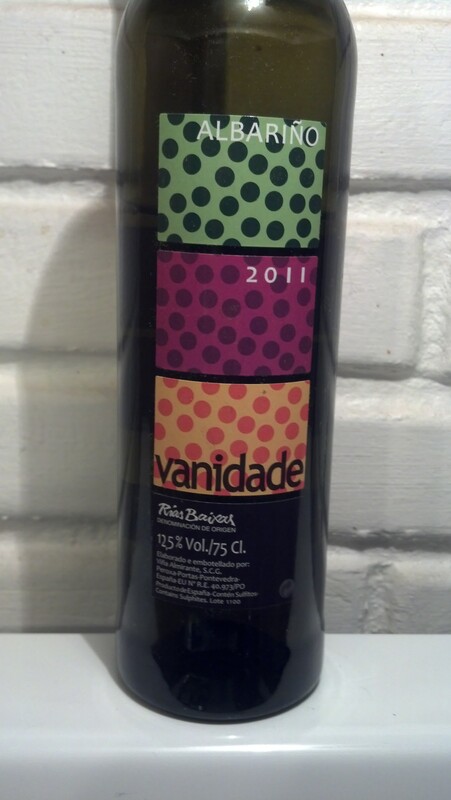 2011 Vanidade Rias Baixas Albarino | Wine Splash! Ok, ok…. I actually bought a few bottles of this wine because of…. forgive me for saying this …. “The Label”. I know, I know…. this is taboo in my book and every bottle of wine I have ever had with a “cutesy” label has turned out to be quite unimpressive. But the vibrant colors caught my eye and it just had a fun “confetti” look to it! And I was fresh out of Albarino at home so this filled that lonely space in my cellar. Well, in my opinion, this venture paid off and for only $11 a bottle, I feel I got more than my moneys worth. In my glass, day bright yellow and a clear rim. The nose had an essence of tangerine, lime, and was even a bit grassy. Flavors of bright citrus, lemon, and stone fruit slapped up my palate and showed me who’s boss! The mouth feel was medium bodied with a nice balance of acid and fruit. This was a full fledged Citrus Tsunami! Lively, expressive, with hints of summer and an ocean breeze blowing through my hair. On the second sip, the citrus stayed pronounced but also found some mango, honeydew, and some light minerality on the finish. Fun and exciting and I want to book my trip to Rias Baixas, Spain today! This is a flavorful, no pressure, put your sandals on type of Albarino that begs for a warm sunny day. Its not sunny or warm where I am today but it does give me those memories. I would pair this wine with a Lemon Herb Roasted Chicken, seafood, pasta with alfredo sauce, medium cheeses, or a fresh salad. I am very pleased with the 2011 Rias Baixas Vanidade Albarino and give it an 89 Point rating. It is fun, vibrant, balanced, with a bit of finesse. If you have a 2011 vintage of this wine, I feel it will last well into 2015. WineSplashing! !